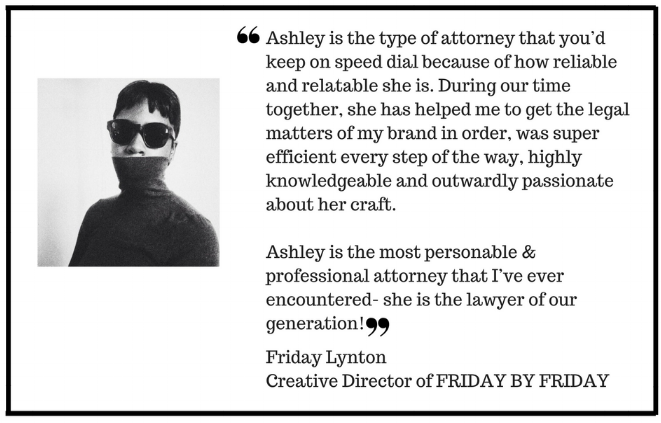 Ashley Williams Law PLLC is an Unorthodox Legal practice that strives to offer unconventional and effective legal counsel to creative entrepreneurs. We understand the shift in the culture and recognize that the modern day way of doing business is through the internet (or thru text messages)! Ashley Williams Law PLLC can provide adequate virtual legal counsel and protect your brand to the fullest, all at the click of a send button! I make the law simple, accessible and most importantly, fun. We are committed to providing Unorthodox Legal Services! NOT SURE WHAT YOU NEED TO GET YOUR BUSINESS LEGALLY SOUND? TELL ME MORE ABOUT YOURSELF AND WE CAN DETERMINE WHAT SERVICES BEST SUIT YOU!